SayWhatNews: Good morning Luisa. Thanks for interviewing with SayWhatNews. First tell us who is Luisa D’Oliveira? Luisa: I sure haven't figured that out completely! I would say I'm an actress who wants to entertain and connect with people. I've gravitated towards being creative my whole life. I love so many different creative mediums...writing, art, but my heart is in acting and storytelling the most. I also care a lot about people and get very affected by their emotions. I think the reason I love film, TV and theatre so much is because it brings out the audiences emotion in a safe environment and can be very thought provoking. I think through watching actors, we're able to reflect on things and feel emotion that we might normally suppress, but because it's in the form of entertainment we don't fight it as much. There's no emotional cost; that kind of self-discovery can happen more easily. At least, that's how I'm affected from watching other actors and I love to be able to give that to others. Plus...it’s fun! SayWhatNews: Luisa, you were born and raised in Vancouver, BC. Tell us about your most memorable time growing up in Vancouver? Luisa: I can think of two most memorable times. When I was a kid, my brother and two of our cousins would spend entire summers going on adventures around Vancouver with something called "Kid Summer." There was something new to do every day. We went to waterparks, toured chocolate factories, went to the fair...it was the best! Whenever we weren't doing that we would play these set games, acting scenarios really. There was the Karate Class, a Wedding, the Evil Babysitter, or just regular House. The other most memorable time was at my high school, Notre Dame. I was saturated with acting and performing there. I was in choir, show choir, plays, musicals, wrote speeches for competitions and made short films. I couldn't have asked for a better place to explore acting, and I loved it. SayWhatNews: Your professional acting career started roughly around 4 years ago. How did having family movie night with your family inspire you to become an actress? Luisa: Watching films gave me so much joy as a kid. I used to watch a film with my family during movie night, watch it again the next day, and then act out my favorite scenes from the film at the dinner table. My parents unknowingly created this great, repetitive schedule where once a week I'd be exposed to a new film and was able to explore what I thought was great about it. I think it was really their sometimes enjoyment but more often patience with me that nurtured my creativity. They are wonderful people and I'm so lucky to have them. SayWhatNews: Luisa, you made your acting debut on the hit CW show “Supernatural”. How did you learn about the gig and what was the audition process like? Luisa: I heard about it through my agent and the audition process was pretty regular. Except that time I got the call that I booked it! My main goal back then was to just do a good audition, get a callback, and not make a fool of myself. Getting the role was such an amazing affirmation of all the work I had put into my career up to that point. SayWhatNews: Like so many, I am a huge “Supernatural” fan. What was it like working on the set with the Winchester Brothers: Dean (Jensen Ackles) and Sam (Jared Padalecki)? Luisa: In my scene I drown in a vat of water while bobbing for apples. When we were just about to begin shooting the drowning stunt, Jared came by set and made a big announcement that no one needed to worry, he was a trained lifeguard and all would be well...and that was the extent of my working with the boys. I don't even think I said anything to him. I was too focused on doing the stunt well! That being said, the set is amazing. They have a great crew and a great vibe on set. The main actors usually set the tone so based on how much fun the crew was having I would imagine Jensen and Jared are great to work with. SayWhatNews: So what was it like working with all those cool special effects and scary supernatural beings? Luisa: It was fantastic. No supernatural beings graced my scene, but the special effects were great. I had to go through all the stages of drowning with a camera underneath the vat of water about a foot away from my face. The water started boiling, the vat was moving this way and that as I struggled to get out-- I had some amazing burn makeup on my face, it was awesome. From what I saw, they are very good at anticipating everything they need to make great effects. The whole camera crew was soaked at the end of the scene, but I'm sure there were fluffy towels ready and waiting. SayWhatNews: After your TV debut on “Supernatural”, your acting career really kicked off—you starred in CBS hit series “The Good Wife”, CW’s “Hellcats” and “The Secret Circle”, USA’s “Psych” and more. So far, which role has been your most favorite/challenging? Luisa: Of those, my role on The Good Wife was the most challenging. I played a lawyer and it was my first "adult" role up to that point. I had to find a different place for that character to sit in my body, I was determined to give it the gravity it needed. There was seriousness on that set that I hadn't experienced yet. The writing has a lot of professional gravity to it because it's the world of law, and they had the money and time to get everything right. It was both intimidating and inspiring. Julianna Margulies and David Paymer are such fantastic actors, and some of my scenes consisted of observing them in court. I really enjoyed soaking in the brilliance and subtlety of their performance. It was a wonderful experience and I learned a lot from it. SayWhatNews: Luisa, you star in CBC’s popular series, “Cracked” which is now in Season 2. Tell us about the show and your character Poppy Wisnefski? Luisa: Cracked is about police cases where crime meets mental illness. It's about a detective who has a lot of personal demons that he's gained from his job, and because of that his job is more difficult but he's also better at it. Poppy Wisnefski is the truest blue cop on the show...police work runs in her veins. She has a very steady point of view on how crimes and criminals should be handled. Even if the others in the Psych Crimes unit disagree with her opinions they know what to expect from her and they know they can count on her to be a team player. Her strong opinion is occasionally called into question as she sees more and more of the complicated gray area that occurs where mental illness crosses crime. SayWhatNews: The season finale of season 2 of “Cracked” is almost near. Can you provide the fans with what to expect or any shockers? 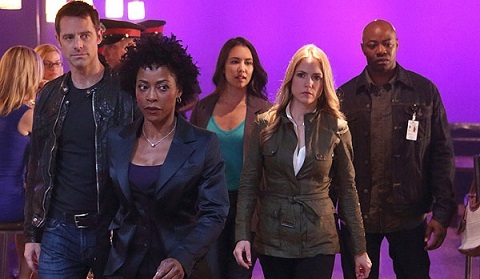 Luisa: The case in our season finale isn't like any case Psych Crimes has handled yet. It's bigger than what we usually encounter, it comes at us sideways and unexpectedly. There's some very interesting elements of mental illness to it, and danger. I'm very excited myself to see it! SayWhatNews: Sounds like “Cracked” fans will not be disappointed. Now, in the film, “Endangered” you star alongside James Marsden, Thomas Jane, Scott Glenn, Piper Perabo and Billy Bob Thornton. What was it like working with such talented actors? Luisa: Working with those actors was fantastic! They truly know their craft. I understand why they have the careers they do. There is such commitment to the work. During scenes there was never a moment I didn't believe what they were doing. It was all so raw and real. I remember watching Billy Bob run lines. Everything he said was fascinating, I just wanted to know more. SayWhatNews: You have worked with so many amazing/talented actors. Who is the one dream co-star you would love to work with and why? Luisa: I would love to work with Michael Fassbender. He brings so much raw emotion to everything I've seen him do. He's brilliant and fearless. His work inspires me. I know I would learn so much from working with him. He's not bad to look at either. SayWhatNews: Luisa, your schedule is so busy. What do you like to do for fun in your spare time? Luisa: I like to relax! Shooting schedules are so intense and when you get an audition that takes over everything, so when I have time off from both I like to do regular things like grocery shop, cook, clean my bathroom, do the laundry, watch a movie. SayWhatNews: If you had front-row tickets to a concert, whoseconcert would it be? Luisa: Amy Winehouse! My god I wish I had seen her live. My heart broke the day she died. That woman's music was an absolute gift. SayWhatNews: Oh yes, Amy Winehouse had an amazing voice. I to wish I had seen her perform live. Tell us something no one knows about you? Luisa: I wore headgear in elementary school, glasses, and braces. I'm surprised I didn't set off metal detectors back then. SayWhatNews: What’s next in the future for Luisa D’Oliveira? Luisa: Hopefully season three of Cracked, and some features down the line. I plan to see where the wind takes me.